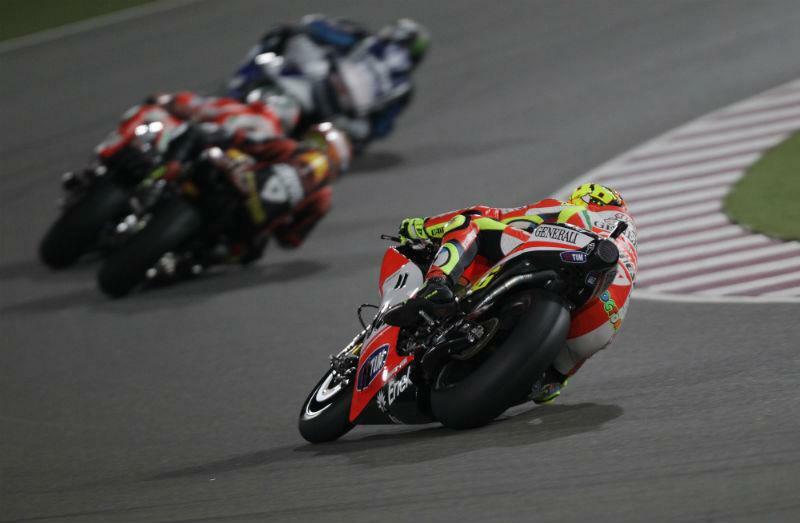 Valentino Rossi and Ducati endured a dark night in Qatar after the Italian slumped to a dismal 10th place finish to start the new 1000cc MotoGP world championship. The nine-times world champion was a massive 33 seconds behind winner Jorge Lorenzo and at best Rossi could have only hoped for a top six finish with the new GP12 Desmosedici way off the pace of Honda and Yamaha. A chronic understeer issue and a lack of grip caused by an aggressive power delivery means the new GP12 hasn't improved Rossi’s fortunes after a disastrous debut season with the Bologna factory in 2011. The Italian was locked in an early fight for the top six with team-mate Nicky Hayden, Alvaro Bautista, Stefan Bradl and Hector Barbera. But his hopes of securing a top six were effectively ended on lap five when he was forced off track by an aggressive overtake by Pramac Ducati rider Barbera. Rossi’s frustrations boiled over after the humbling 22-lap race and for the first time he strongly criticised Ducati and the performance of the GP12. And his Australian crew chief Jerry Burgess admitted the opening race simply wasn’t good enough. Speaking exclusively to MCN, Burgess said: “It is not good enough and we've got a lot more to go. We always knew we would have to and it is a case of finding the tenths before we find the seconds. But it is clearly not podium stuff so we've got to do a bit more. "I think we've got to do the work before we get the reward and not a lot is going to change in a fortnight before Jerez. We've learnt a bit here but not enough to make any serious difference. "I don't think he was expecting the podium here and we would have been in the Nicky and Bautista mix. He would not have been happy with that either because that would have placed him only sixth or seventh. Rossi was the slowest of the 12 factory riders in the race with a quickest lap of 1.57.144, which was 1.6s slower than the fastest lap set by reigning world champion Casey Stoner. Burgess said: “We were doing the same times as the Nicky group but nothing more startling than that. I think we would have been in that mix somewhere at the end but that's about it. It got better and better as the grip went away but a 57.1 is still off the pace of the guys at the front. For full coverage from the Qatar MotoGP race, see the April 11 issue of MCN.